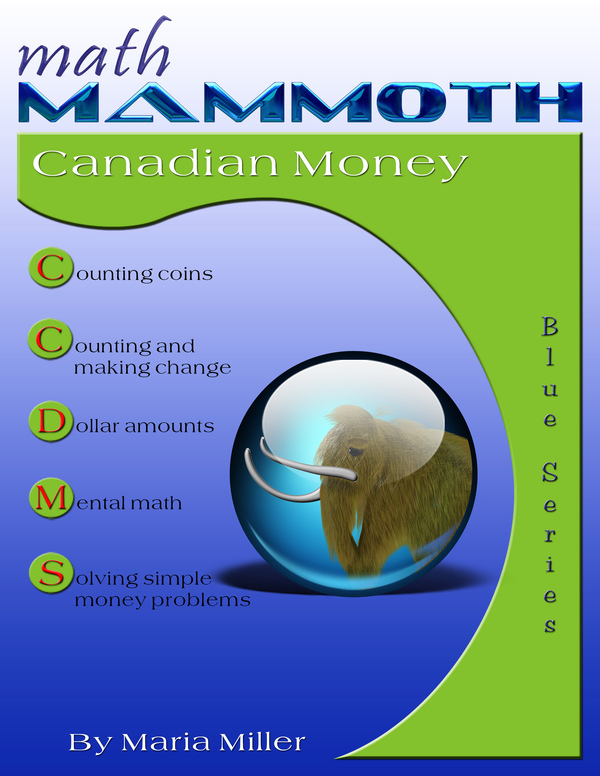 Math Mammoth Canadian Money - elementary math workbook about counting coins and money problems for grades 1, 2, and 3. Download and print. 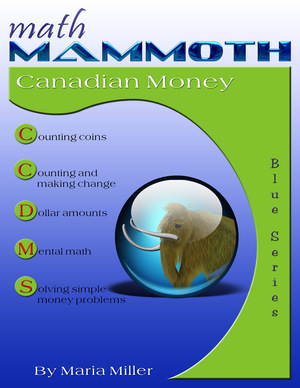 Math Mammoth Canadian Money is a worktext that covers money-related topics usually encountered during grades 1-3, using the coins and bills of Canada. The book contains both textbook explanations and exercises, and is designed to be very easy to teach from, requiring very little teacher preparation (you do need to find some practice coins before the lessons). The book starts with first-grade topics such as counting Canadian nickels, dimes, and quarters. While the lessons use pictures for the coins, practicing with real coins is even better and you should have real money on hand to practice with. From there, the lessons advance towards second-grade, and finally to third grade topics. Therefore, you can also let your child work the pages of this book in different time periods, and not go through it all at once, depending on your child's current level. The lesson Making Change explains two basic ways of finding the change: counting up, and subtracting (finding the difference). This is all done with mental math. The next lesson also practices money problems using mental math.